No ambient light is the best light. In most types of photography we are concerned with colour, direction, intensity, etc. of light; in many cases it is very complicated and unusual light that creates striking images. Photographing star trails is one of the very few types of photography where exactly the opposite is required—ideally, there should be no ambient light whatsoever. This means that, first, you should get far away from the cities—no matter how dim or distant their lights are they are bright enough to make an undesirable impact due to long exposures; second, moonlight is undesirable, too, as it is also too bright for long exposures (under a full moon only a several minute exposure at ISO100 and relatively large aperture creates a daylight–like look!). Crescent moons are fine for relatively short exposure times if you want to illuminate foreground, though. The sky should be as dark and clear as possible. There should be no clouds (they would create a blurred effect) and, ideally, no haze. Composition. 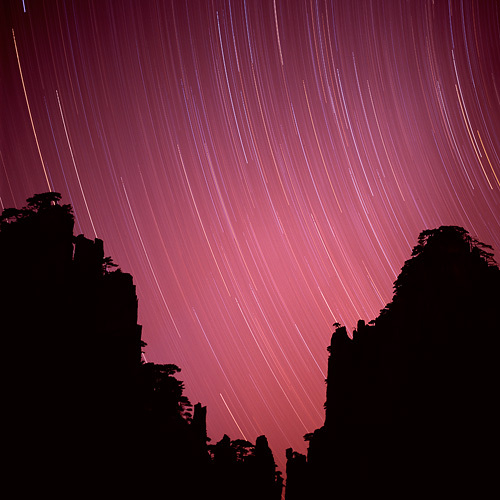 It is crucial to find a suitable and interesting foreground subject—star trails simply look like white or coloured streaks without it. Alternatively, you might want to use star trails to render a given subject in a rather unusual way (if it allows to be photographed with star trails, that is). Remember about star trails photography and do not get lazy when you happen to be in the right place at the right time. The above mentioned conditions are quite restrictive and one has to be a real star trails photography connoisseur to seek a perfect star trails scene on purpose. I suggest keeping in mind that this type of photography is really easy when, say, you happen to be in the middle of nowhere on a moonless night under a dark sky full of stars. Give it at least one shot before you hit the sack. Pre-visualise outcome. Find the North Star (Polaris)—locate the Big Dipper and follow the two stars at the end of the basin upward, which should lead you directly to Polaris; it is the last star in the tail of the Little Dipper. Keeping in mind that the other stars appear to revolve around it, check how star trails are going to appear in relation to your main subject or, if you choose the North Star and circular star trails around it as your main theme, check what foreground looks like. Exposure: aperture. Exposure, generally, is the easy part—you do not even need a light meter! In total darkness you normally would want to capture as much light as possible, which means that you need to use your lens at a relatively large aperture. Keep in mind, though, that aperture partly controls how bright the trails are going to be in the photograph and if you use a very fast lens wide–open you might actually get more trails than you probably want. This has also to do with the focal length of the lens—lenses of longer focal length offer larger magnification and thus allow using smaller apertures; likewise, you might want to use your wide–angle lens wide open. In some cases you might need to stop the lens down a stop or two—for instance, if your foreground subject is relatively close to the camera and you need a deeper depth–of–field, or if your lens exhibits unpleasant light fall–off and you want to make corner–to–corner illumination more even. Exposure: time. Exposure time partly defines how long star trails are going to be in the picture and does not influence brightness of the trails. Exposure time also depends on the focal length of the lens—lenses of different focal lengths cover different area of the sky and you will need to adjust exposure accordingly, i.e. 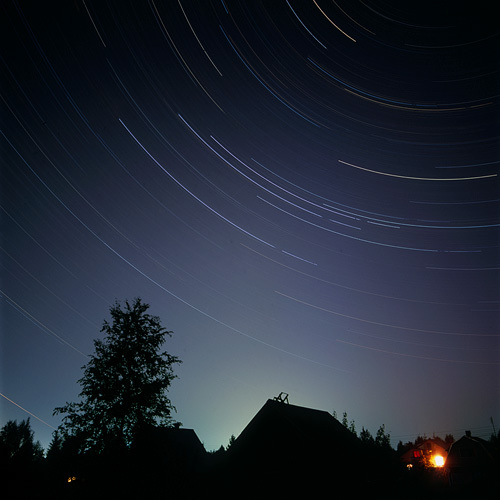 the shorter the focal length the longer the exposure will have to be to create star trails of equivalent appearance and vise versa. When using a standard lens (50mm in 35mm format), a twenty minute exposure is the minimum required for star trails to start looking like star trails; I find that one hour exposure creates the look I like most; anything over three hours might be a bit overkill. Another factor that you have to account for is how far the part of the sky you intend to photograph is from the North Star—the closer it is the shorter star trails will appear for a given exposure time. And of course, your patience is yet another important issue—indeed, I find that one of the difficult aspects of photographing star trails is figuring out what to do for such a long time in total darkness! Colour shift (reciprocity failure). Long exposures generally induce colour shift, i.e. colours in a photograph are very different from what you actually saw—the picture above is a good example. As far as film is concerned, it is a well known phenomenon (note, though, that different films have different reciprocity failure characteristics); as to digital capture, it appears to be further complicated by the influence of infrared (IR) light—in short exposures it is effectively filtered out but longer exposures might suffice for it to make an impact on the image. In my opinion this is not a major issue when photographing star trails, though, as photographs are quite surreal to begin with and colour shift only adds to the unique appearance. Film vs. digital; mechanical vs. electronic. Most digital cameras are still not good for long exposures—you will have to deal with (thermal) noise, which is inevitable during exposures of more than several seconds; another potential problem is enormous battery power consumption during long exposures. As to the latter, it might also be problematic with film cameras with electronic shutters. If possible, use a fully mechanical camera and film—no muss, no fuss. Film speed. ISO50 and ISO100 are perfectly fine; anything more sensitive than ISO400 is likely to have too much grain, which you do not want. Lenses. Any focal length from almost fish–eye to normal is fine—choose one depending on your foreground subject and/or area of the sky that you would like to capture. Do not forget to check that foreground is in focus, which in most cases is likely to be at infinity. Accessories. Apart from a sturdy tripod (you never know—strong wind might start blowing during a long exposure) you will also need a locking cable release, a flashlight, a clock to time exposure, a small electronic fan to prevent dew from fogging up the lens. Also consider bringing something to drink and keep yourself busy with for several hours (your iPod? ).